The older they are, the better they fit. Do you ever wonder why Levi's calls their jeans the 501? So do we and believe it or not, so does Levi's. They even have an employee on the case to figure out that and all the other mysteries that surround one of the country's oldest companies. Ask the inventers of the blue jeans about their rich history -- that dates back to the 1850s -- and it's kind of like they've been caught with their pants down. "It's very strange and frustrating to have a black hole in the 19th century," said Lynn Downey, the company's historian. Problem is, the San Francisco earthquake and fire of 1906 obliterated the headquarters of Levi Strauss. "All the old jeans, everything, completely burned. So I'm not taking any chances," Downey said. Downey is using jeans to retrace the lost parts of the company's DNA, especially really old Levis like a pair found in a Nevada mining town. When she first inspected its rivets, Downey thought they were 501s from the 19th century. "But they're not the 501," Downey said. "The 501 was the original jean. This was a different kind of denim workwear that we'd never seen before. It had a pocket for a ruler." Levi's reached into its own pocket and shelled out more than $46,000 for the mystery pair they now simply refer to as the "Nevada jeans." "I was willing to pay more," Downey said. Perhaps she'd pay more for the answer to one ever-burning question. "Where'd the name 501 come from?" Downey wondered aloud. "It wasn't called that when first created in 1873. It was called the 'double x,' which was the name for the denim we used." Downey's guess is that 501 might've been an arbitrary ordering number. "Another mystery is the pocket stitching, which has been on our jeans since day one. We don't know what it was supposed to represent or function," she said. 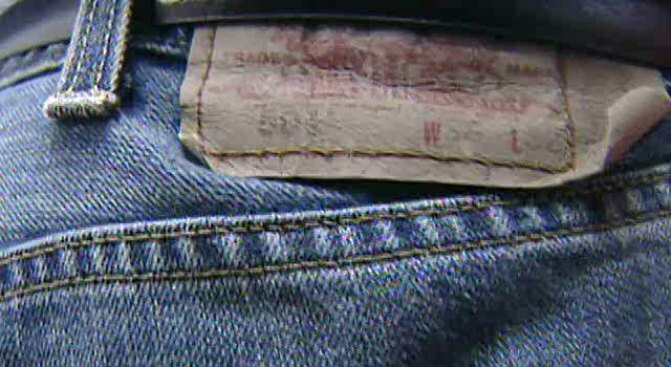 The Levi Strauss company's vast collection of vintage clothes also includes the world's oldest pair of jeans: double x's from 1879 valued at $125,000. "It reflects the person who lived in it," Downey explains. "We can learn so much about who our consumers were and then our designers can understand how these can be used to inspire new products." The company has also now invested in fireproof safes for their important archives.